When I met David, he owned a device for measuring the radiation emitted by the microwave oven, or anywhere else (various sources emit radiation, not just nuclear plants). Although I had blithely gone about my business without a care for 40 years, David knew about radiation because he worked with radio waves. One or more of the medicines I take make me hypersensitive to radiation, and I have had a problem with computers before. From now on, I’m back to my Kindle (which has a filter) for most of my reading, as it doesn’t seem to have the same negative effect. I must remember to put sunscreen on my face before I use the iPad…at least until I find an antI-radiation filter for it. I used radiation filters at work, and we have anti-radiation films covering the desktop monitor screens around the house. David isn’t bothered by radiation, but having had skin cancer on my face a few times, I take precautions. I want to be able to work anywhere. Last month, I registered with the Department of Recreation in the adjacent county so that I can attend a Saturday symposium at Greenspring Gardens, or high tea on Sundays, or whatever else the county might offer, such as day trips to out-of-town gardens. Generally, the day trips are for adults, an important consideration for me. Besides, the card admits me to the county swimming pools. Our gym pool was freezing this AM so I only stayed a half hour, then sat in the hot tub another 10 minutes. As I was leaving, Vince caught up with me, headed to the locker room after a quick dip. I don’t feel like punishing myself, he said. We both complained at the front desk. Our class is for folks with arthritis and cold makes us worse for heaven’s sake. The witch-hazels are deciduous shrubs or (rarely) small trees growing to 3–8 metres (9.8–26.2 ft) tall, rarely to 12 metres (39 ft) tall. The leaves are alternately arranged, oval, 4–16 centimetres (1.6–6.3 in) long and 3–11 centimetres (1.2–4.3 in) broad, with a smooth or wavy margin. The genus name, Hamamelis, means “together with fruit”, referring to the simultaneous occurrence of flowers with the maturing fruit from the previous year. H. virginiana blooms in September-November while the other species bloom from January-March. Each flower has four slender strap-shaped petals 1–2 centimetres (0.39–0.79 in) long, pale to dark yellow, orange, or red. The fruit is a two-part capsule 1 centimetre (0.39 in) long, containing a single 5 millimetres (0.20 in) glossy black seed in each of the two parts; the capsule splits explosively at maturity in the autumn about 8 months after flowering, ejecting the seeds with sufficient force to fly for distances of up to 10 metres (33 ft), thus another alternative name “Snapping Hazel”. This post is linked to Michelle’s Nature Notes. This entry was posted in Books, Elder Blogger, Environment and Nature, Gardening and Gardens, Health/Medical Stuff, Photography, Retirement Living, Technology and Science by SchmidleysScribblins. Bookmark the permalink. What lovely photos. I had no idea what a witch hazel plant looked like! I love all your beautiful bushes, Dianne. Ummm… radiation from the Kindle? Yikes! More things to worry about? Such lovely photographs. It is so cold, your photographs are very warming. 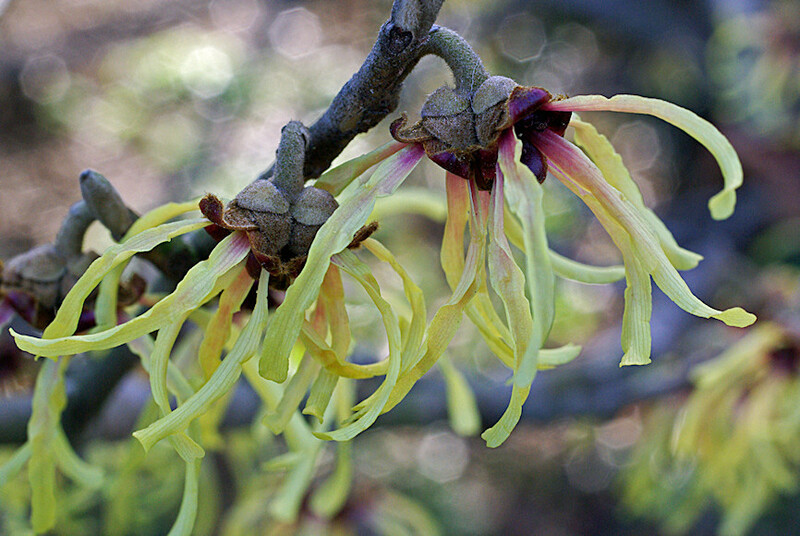 The witch hazel is pretty, lovely images. I learned something new about the ipad, thanks. Beautiful witch hazel, I have the orange one growing in my garden. I hadn’t heard that there’s an Ibird app. I shall check it out. Too bad about the cold water pool, it’s not something I’d volunteer for either. An iBird app for the UK too. Interesting, that some are sensitive to radiation and others are not. The witch hazels are beautiful! Fabulous photos! 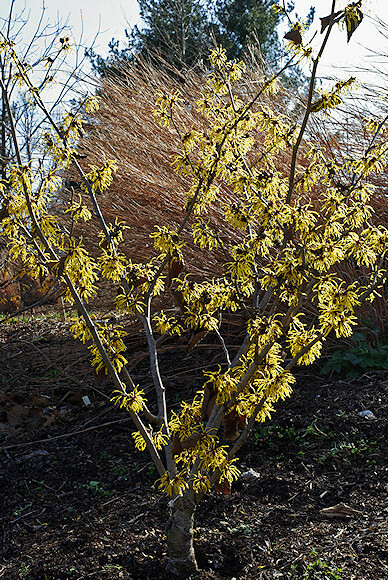 Witch Hazel is makes a lovely soothing skin astringent. I didn’t know that about the iPad! I’d get rid of the iPad. Not acceptable at all. 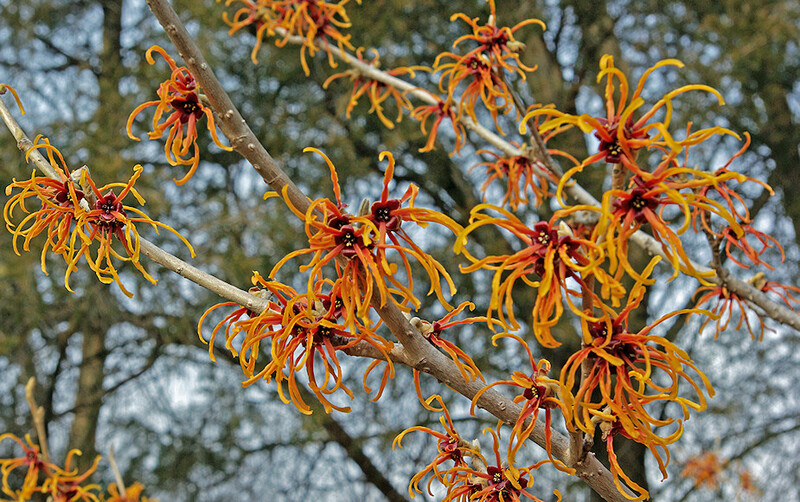 Love the pictures of the Witchhazel tho. My grandmother used it as a cure all, and I still remember the scent and coolness of it today. They will pry my iPad out of my cold dead hands. Besides ALL electronic devices emit radiation. Getting an anti-radiation film for the iPad and wearing sunscreen. I am hypersensitive to the radiation owing to the meds I take. Children’s eyes are more at risk! Thanks Carole. Great idea. Perhaps Greenspring will let me have some branches…not. I never realized Witch Hazel had such pretty flowers on them. Lovely photos Dianne. I have often wondered about the radiation factor from all our ‘toys’. It’s a scary thought. Too bad about the cold water, I hope the people at the desk took note. Our world needs more of these lovely plants! Interesting post and I like the shots you captured very much. Thanks. The photos are from Greenspring Gardens. When I was a kid I remember shoe stores having these machines that looked like the old timey weigh you machines, that x-rayed your feet in the shoes you were thinking of buying. The earth is the greatest source of radiation! Boy, what’s next? You’re damned if you do, and damned if you don’t. Hope you don’t get skin cancer from the iPad. And cold water keeps me from swimming. I haven’t been to the beach since Nov 2012, after my trip to India. I sure don’t need the extra radiation from another source! Worse for children. They have a lifetime of exposure ahead. Thanks Michelle. Witch Hazel is amazing. Is that true about radiation? I’ve never heard that before. Absolutely. Little kids especially need protection.